The White Pass Scenic Byway travels along US-12 from I-5 (between Chehalis and Castle Rock) to Naches exploring the majestic Cascade Mountains and central Washington. The road travels to an elevation of 4,500 feet, revealing expansive mountain views, some tree-covered, some jagged rock and some snow-capped. Add in lush forest, sparkling lakes and streams and you have a picture perfect drive. Recreation of every type and every level abounds, or simply enjoy the unparalleled natural scenery. 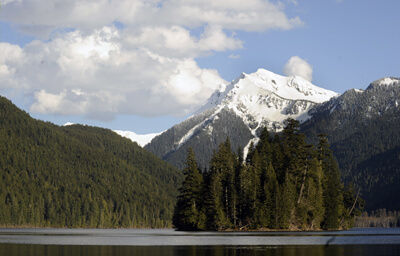 At Packwood Lake, enjoy hiking, fishing and camping. The drive can be done in either direction. We describe it starting on US-12 near I-5, exit 68. If you’re coming from Naches, begin on US-12 at the intersection of WA-410. Begin on US-12 heading east. The Lewis and Clark State Park (H17) is home to a major stand of old-growth forest. Learn about this unique forest primarily of Douglas Fir and Red Cedar on the half-mile self-guided interpretive trail, or explore deeper with longer hikes or on horseback trails. Amenities include first-come first served campsites, primitive equestrian sites, horseshoe pits and volleyball field. Many structures in the park were built by the Civilian Conservation Corps. All Washington State Parks charge a day use fee, or use your Discover Pass. Nearby, consider a visit to the John R. Jackson House Historic Site (A5), which features one of the oldest pioneer homes north of the Columbia River. Originally built in 1845, the house was reconstructed by the CCC in the 1930’s. You can view only through the windows, but tours are available by appointment. If you love fishing, take a side trip to the Cowlitz River. The Cowlitz Trout Hatchery (A4) raises over 1.5 million fish each year. Tour the facilities and then fish for cutthroat trout, steelhead, Chinook and Coho salmon. Newly added are ADA wheelchair accessible fishing platforms near the Blue Creek boat launch. There is no charge to use the boat launch and a Discover Pass is not required. While here, visit the Barrier Dam and the Cowlitz Salmon Hatchery (A3). The Education Center features hands-on exhibits that teach the challenging journey in the life of a salmon. You’ll also find the Barrier Dam boat launch and ADA-accessible fishing ramp. Our drive continues on US-12. Set along Mayfield Lake, Ike Kinswa State Park (H16) is perfect for swimming, fishing, boating and camping. Riffe Lake in Mossyrock is another popular spot for anglers, boaters, and those who just want to relax amid pristine views. The lake was formed by the Mossyrock Dam, Washington State’s tallest dam, and is host to two parks. Mossyrock Park (H15) offers swimming, fishing, camping, a playground, volleyball and horseshoe pits. Or try Taidnapam Park (H14) at the eastern end of the lake, which has similar amenities and a popular fishing bridge. There is a small day use parking fee for both parks on weekends and holidays, but free on weekdays. Celebrate the Mossyrock Blueberry Festival the first weekend in August. Enjoy live music, a parade, car show, pie eating contests and of course indulging in delicious blueberry treats. There are a few u-pick and farms stands in the area to enjoy the local harvest. South of Morton, the Peterman Ridge Unit of the Cowlitz Wildlife Area (H13) protects over 6,800 acres of varied habitat. Ten miles of trails offer the chance to spot pileated woodpeckers, bald eagles, osprey, deer, elk, beaver and more. A Discover Pass is required on all WDFW lands. Stop at the Hopkins Hill Viewpoint (V2) which delivers an excellent view into the crater of Mt. St. Helens. If you haven’t been to this fascinating mountain, we highly recommend a trip here. Our drive continues on US-12, but if you want to visit Mt Rainier National Park via the Nisqually Entrance, turn left on Highway 7 in the town of Morton. Packwood is the last town before heading east over White Pass, or north towards Mt. Rainier, and a good place to make sure you have ample gas as there are limited services along the route. You’ll also find restaurants, shops and lodging. Elk are commonly seen grazing in nearby fields. Continuing on US-12, stop at the Palisades Viewpoint (V1) for a view of interesting volcanic basalt palisades. Shortly after this stop, is the Mount Rainier Viewpoint featuring views of Mt. Rainier and the jagged Goat Rocks. The White Pass Ski Area (A2) is a premier winter recreation destination offering alpine skiing, snowboarding, and a Nordic center with 18K of groomed trails. A full service resort, you’ll find equipment rentals, lessons, dining options and lodging. Every season rewards with breathtaking views of Mt. Rainier, the Goat Rocks and Mt. Adams. A section of the Pacific Crest National Scenic Trail which runs from Mexico through California, Oregon, and Washington up to Canada passes here. Just 1.5 miles south of White Pass, is Knuppenburg Lake (H6). Nestled amid the snow-covered peaks of the Goat Rocks Wilderness area, enjoy fishing, hiking and camping. Shortly after the Pass, you will approach Dog Lake where you can enjoy boating, fishing, and camping. Hike the Dog Lake to Cramer Lake Trail (H5) which features little elevation gain, and beautiful views of the William O. Douglas Wilderness. Spiral Butte is also visible from here. Back on the road you will see glimpses of Clear Lake (H3). Turn left on Tieton Reservoir Road (NF 1200) and drive for 1 mile to reach it. Enjoy the interpretive trail, a small waterfall, swimming, and wildlife watching opportunities for rocky mountain elk, bighorn sheep, and bald eagles. Rimrock Lake (W1) is open year-round and offers fishing for rainbow trout and kokanee, water skiing, tubing, and kayaking, as well as cabin rentals, RV and tent camping. On the east side of the lake, there is a visitor center where you can learn about Rimrock Dam. On the west end of the lake, you will notice Kloochman Rock, a volcanic dike that rises over 2,000 feet and is almost a mile long. A few trails circumnavigate Kloochman Rock, but an ascent to the summit is best left for experienced rock climbers, as is nearby Goose Egg Mountain. Before exiting the Wenatchee National Forest, hike the Tieton Nature Trail (H1). The easy 3-mile trail travels along the Tieton River, exploring basaltic columns and other remnants of the area’s volcanic history, as well as cactus, wildflowers, conifer forest, and stunning views. Watch for rattlesnakes in dry grass. White-water rafting is popular on the Tieton River in September, as water released from Rimrock Lake creates Class III Rapids for this month only. Located in the quaint Naches Train Depot is the Naches Visitor Center (I4), open from Memorial Weekend to Labor Day Weekend. Our drive officially ends in Naches. While here explore the small historic town, visit some of the orchards and take advantage of farm stands offering fresh, seasonal produce. From here, you can head into the Yakima Valley and explore the charming downtown, indulge in wine tasting and learn about local award-winning wines, vineyards, cideries and breweries. If you’re staying in the area, consider heading up to Mount Rainier, Mount Adams, Mount St Helens, or take the Chinook Scenic Byway by heading west on WA-410.